Los Alcazares, Roda Golf townhouse for sale. A very low price for this lovely 2 bedroom, 2 bathroom townhouse in a good location on phase 2 on Roda Golf in Los Alcazares. This is a corner property in an excellent location on phase 2 and looks directly on to the swimming pool. Located just a short walk to the mini supermarket, the ultra modern gymnasium, all sports facilities and of course the golf clubhouse and restaurant. 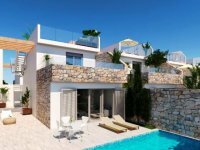 This Roda Golf property has a large terrace with private garden area looking directly on to the communal gardens and swimming pool. This property is sold fully furnished to include hot and cold air con. This 2 bedroom townhouse on Roda Golf is sold complete with private underground parking and storage room. This property on Roda Golf in Los Alcazares offers excellent rental potential. This townhouse would make an ideal holiday home. The beach is just 2 minutes in the car and all the wonderful bars and restaurants in Los Alcazares are just a few minutes by car. A real bargain and is sold fully furnished to include everything for just 145,000 Euros. A MUST VIEW PROPERTY! !